Please Book Showings Between 10Am-7Pm Daily, With Min 4 Hrs Notice (For Baby's Schedule). Offers Welcome Anytime. Min.$25K Deposit Draft/Certified. Include Form 801. Thanks For Showing! Tertia@Bell.Net With Any Questions. Status Certificate Has Been Ordered. Interior Features Rare Gem Condo Loft (The Mozo). 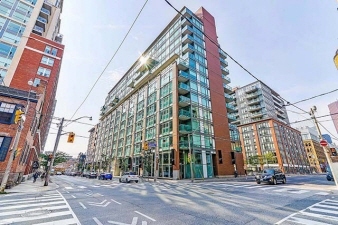 1+1 Bedroom Bright, With High Ceilings, Parking & Locker. This 771 Sf Layout Features Open Concept Kitchen With Great Space For Dining/Eat-In Or Large Island. Nice Living Area With A Walk-Out To Roomy Balcony Facing Court. Open Concept Den For Many Possible Uses (Can Be Separated). Master Bedroom With Full Wall Of Closet Space. Walk To Public Transit, St.Lawrence Mkt, Restaurants, Theatre, 10 Min Walk To Yonge St!!! Exterior Features Refrigerator, Stove, Built-In Microwave Hood & Dishwasher. All Existing Light Fixtures & Window Coverings.